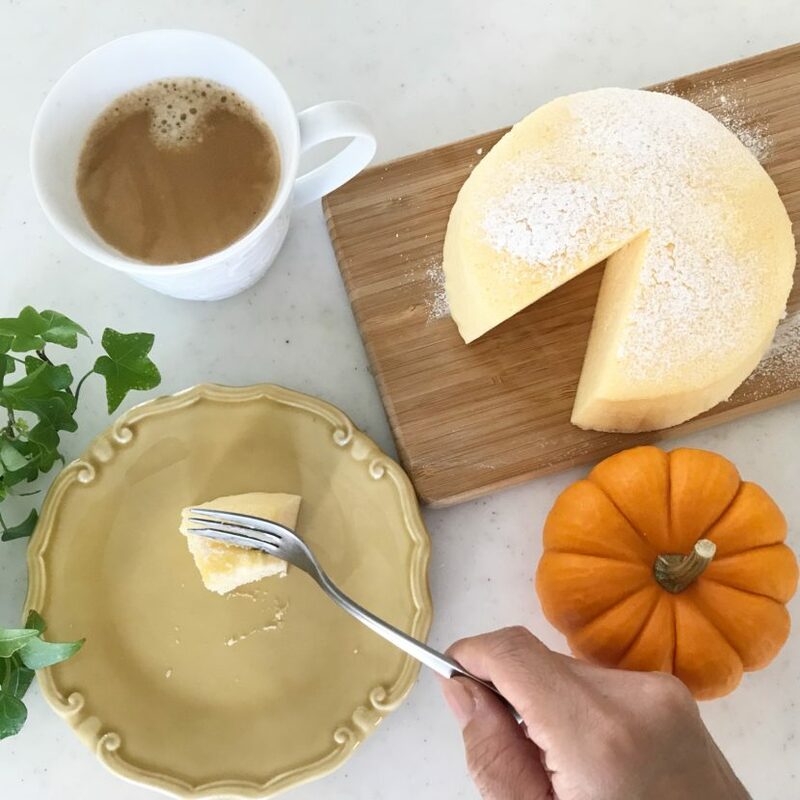 Today, I will show you how to make Japanese Cheesecake, as known as Cotton cheesecake or Souffle cheesecake. Fluffy and moist, the texture is eating like a cloud. But it still tastes so much cheese! Everybody loves the cake in Japan. But actually, the cake is very tricky. Read ( or watch video ) carefully, and do exactly what I do. In general, the simple cake needs more techniques and cares more than a complicated cake. This cake is served as it is, so you can’t do anything after poping into the oven. That’s why. The most important thing about the cake is the consistency of the meringue. Do not over do with your meringue. The second important thing is the temperature of the oven. If your oven has a strong under heater, it may not easy to bake a crackless cake. But don’t be disappointed, we can work it out. Let’s bake a beautiful Japanese cheesecake with me at home! 1. Prepare the mold. Blush the surface of the mold with butter. Butter a parchment paper and set in the mold butter side out. I mean, the butter side will face to the cake butter. This is a crucial part of this recipe, so, don’t skip it. 2. In a large bowl, add room temperature cream cheese and soften with a spatula. If it’s still hard, put the bowl in hot water for a minute or two to soften. Switch to a hand-mixer and cream completely. 3. Add 20g granulated sugar and mix until smooth. Add lukewarm milk in three, mix well each time. 4. Add egg yolk one at a time. Add sifted flour and cornstarch. Add lemon juice and zest, salt and vanilla. Mix well each time and set aside. 5. Let’s make soft meringue. Put egg whites in a medium bowl and start whisking. Start on low and hold the whisk in egg white until foamy. Add one-third of the sugar and continue whisking. Add next one-third of sugar when the sugar added earlier melt. ※how do you know the sugar melt? When your meringue become shiny and you don’t feel sandy texture on the bottom. Add the last sugar. Continue whisking to melt all the sugar on low. 6. When the meringue become dense and foamy like whipped cream, it’s done. It doesn’t even make a soft peak. This is the most important about this recipe. Never over do. 7. Add one scoop of meringue to cheese batter. Take your time to mix with a balloon whisk. 8. Add a half of the rest of meringue and continue mixig. Add all of the meringue and mix thoroughly. 9. Switch to a spatula, to make sure there is no lumps or pocket of meringue. Don’t be afraid to deflate. Mix thoroughly, otherwise your cake will not evenly baked. 10. Transfer to the prepared mold. Bake at 150℃ for 40 minutes in hot water bath. ※This is how I do. Put your cake mold onto a kitchen towel-lined tray and set in the lower rack of the oven. Then, pour hot water, and start baking. Do not pour hot water before setting in the oven to avoid touching hot water. Be careful not to burn yourself. ※If you can turn off the under heat of your oven, just cut it off. I believe almost all of you can’t control the under heat, so here is what you do. Put extra tray or mold underneath the cake mold to moderate the direct heat. I found that the strong heat from the under would make a crack. 11.After 40 minutes, when you touch the cake, and it bounces back, it’s done. Hold something to slightly open the oven door (in my case, a core of the plastic wrap) leave it an hour to cool slowly to make no crack. 12.Take it out from the oven and chill 3 hours to overnight to develop the flavor. 13.Transfer to a seving tray and dust with powdered sugar. And it pretty much done! Cut a big slice for me. So fluffy and moist, heavenly good. I like to say that this is not just fluffy but tastes so cheese. The lemon zest brighten cheese flavor so much!